Getting caught up in a great book when the weather is cold outside – that is dreamy to me! I love to snuggle up on the couch, the fire going, with a cup of something warm and a book I do not want to put down! 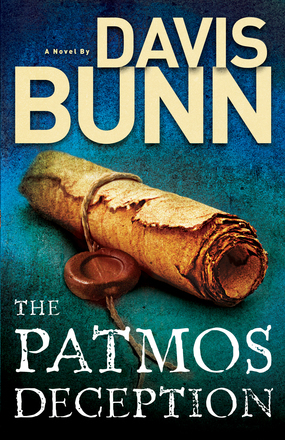 The Patmos Deception by Davis Bunn is the latest novel I have gotten lost in! This is the first novel I have read by Mr. Bunn and I thoroughly enjoyed the amount of suspense balanced with the historical aspects and the geography. I honestly loved hearing the detailed descriptions of the Greek Islands as well as its history. The characters were easily likable – my favorite being Dimitri. I enjoyed the slight romance that went on between the heroine Carey and both male leads Nick and Dimitri. Books that offer a bit of romance but are more focused on the adventure and suspense are some of my favorites. This book fit well into that. In this story we get a glimpse into the real life day-to-day dealings in Greece, specifically Athens once Carey arrives to find her place of employment closed without notice. Carey is swept into a nearby tavern and quickly made a part of a local family with ties to her “former” job. I loved Eleni, the woman who helps Carey process what is going on, and her family who immediately love Carey and support her. Between Eleni’s family and Dimitri’s, we get to see how the Greek people love well. While there are many feel good elements to the Patmos Deception, the suspense will keep you turning the pages wondering what will happen next. NOTE : I was offered a copy of The Patmos Deception in exchange for an honest review by Bethany House. An Ancient Island Holds an Ancient Secret . . .
Carey Mathers, fresh from her studies in forensic archeology, has accepted a job with the prestigious Athens Institute for Antiquities–a dream come true, really, particularly when the Greek isle of Patmos, where the Apostle John received his vision of the Apocalypse, was a particular focus of her research. An internationally-acclaimed author who has sold more than seven million books in sixteen languages, Davis is equal parts writer, scholar, teacher, and sportsman. Honored with four Christy Awards for excellence in historical and suspense fiction, his bestsellers include The Great Divide, Winner Take All, The Meeting Place, The Warning, The Book of Hours, and The Quilt.